Tip: You can purchase sliced almonds and toast them in a 250° oven until browned and toasted (takes about 10 minutes) or you can use salted almonds, coarsely chopped. Cashews are also very tasty! In heavy sauce pan, melt butter. Add sugar, water, and syrup. Stir continuously over medium heat until the candy reaches 300° F. If you don’t get the candy hot enough, it turns out more like fudge than almond roca. Also good, but not quite the same. TIP: If you don’t have a candy thermometer, heat the candy until it turns a dark toffee color, gets an oily sheen, and all starts to move as one in the pan. TIP: Keep a couple of spoons handy and switch one out for the other while stirring. I have burned a few spoons making this! Remove from heat. 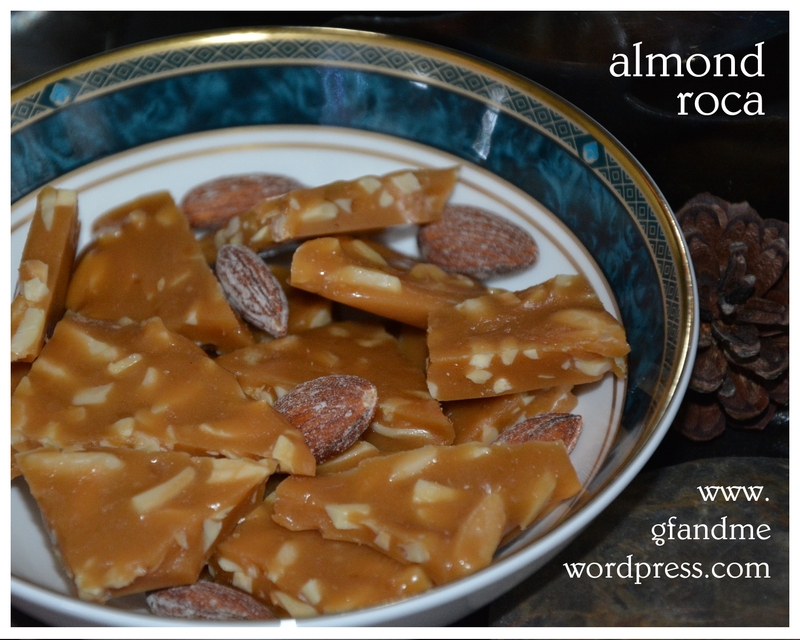 Add the almonds and pour onto a buttered cookie sheet. If you want to top with chocolate, sprinkle the chips over top while the candy is still hot. Once cooled, break into pieces and store in an airtight container in a cool place (but not in the fridge). This entry was posted in Baking, Drinks & Desserts, Recipes and tagged almond, candy, celiac, Christmas, GF, gluten free, thanksgiving. Bookmark the permalink. Looks delicious. I like to make candy for the holidays instead of cookies. I do too. It’s the only time of year I do it so it just seems a bit more special. Thanks! It is hard to keep around! Glad we could help – you and your gym! Whenever I watch shows like Top Chef, I always think about how I can’t actually judge the food by any of its important qualities besides appearance, and am just taking the judges’ word for it (unlike in other silly competition shows like, say, Project Runway or American Idol, where viewers can judge for themselves). Always seemed a bit odd. But I’m happy to take your word for it on the crunch and the smell, and by appearance alone this candy looks delish! I think it’s a winner. Thanks! And that’s so true.